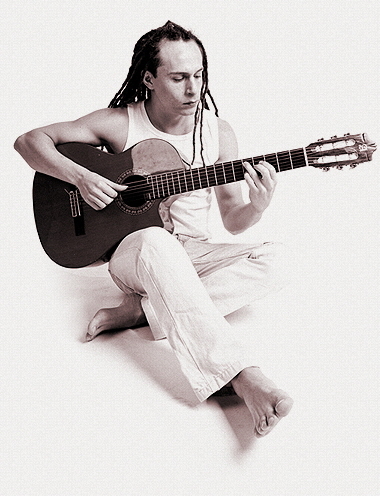 Victor Salvatti is a singer, guitarist, composer and interpreter from Brazil. He began his musical career in 1997 at the age of 15 when he discovered the guitar. Autodidact, always curious, observing what was happening in the streets of Sao Paulo, his hometown, he began to investigate the traditional Brazilian as well as the afro-Brazilian rhythms. After a musical career in Brazil leading projects as folk music and modern music, he decides in 2004 to go to Barcelona with the purpose of making his work known in Europe as also to spread his music, culture and essence to the whole world. There he gets in contact with various cultures and with the world music and he begins to mix folk rhythms with funk and reggae ones. Being in contact with different cultures and people from all over the world made him see that we are all equal, that we are all human beings regardless of where we are born and what we believe in, capable of the impossible if we stay united in a world without borders. In 2009 he launched the Maxi single “Vida Boa”, a mini-disc with four songs, beginning his recording career. In 2012 he launched the Lp “Nossa Terrra” (Our Earth), his first purely acoustic album. The title refers to the planet, to humanity and to people’s unity. He is currently launching his new album “A Mente Nao Mente” (The Mind Doesn’t Lie), whose title refers to the awareness, to that interior voice we all listen to. His album is based on stringed instruments and on worldwide percussion instruments; the lyrics are about the evolution of mankind, race and ethnicity awareness, spiritual evolution and, above all, unity between people.